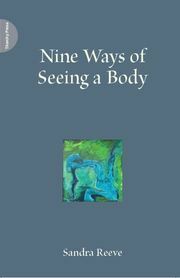 Nine Ways of Seeing a Body is my new book on the many different ways that we can experience our body in movement. Published by Triarchy Press in June 2011 it covers some quite well-known views of the body (for instance the idea of body and mind being quite separate, introduced by Descartes) and some more recent ideas about the body being the way in which we can experience ourselves. It ends with The Ecological Body, which is the culmination of the Move into Life workshop programme and suggests that each of us is a constantly changing element of the whole human and environmental ecosystem around us... that we cannot separate ourselves from our surroundings or say where one ends and the other begins. To read more about it or to order a copy (for £10) visit the publisher's website. See also details of the second volume in this collection: Ways of Seeing a Body: Body and Performance. I love your book and will use it as a text in one of my courses next fall....I am now using it starting next week. ...a small and perfectly formed book, which is by no means small in content. The image on the front of the book is by Greta Berlin in whose sculpture garden we normally move during Ecological Body workshop.